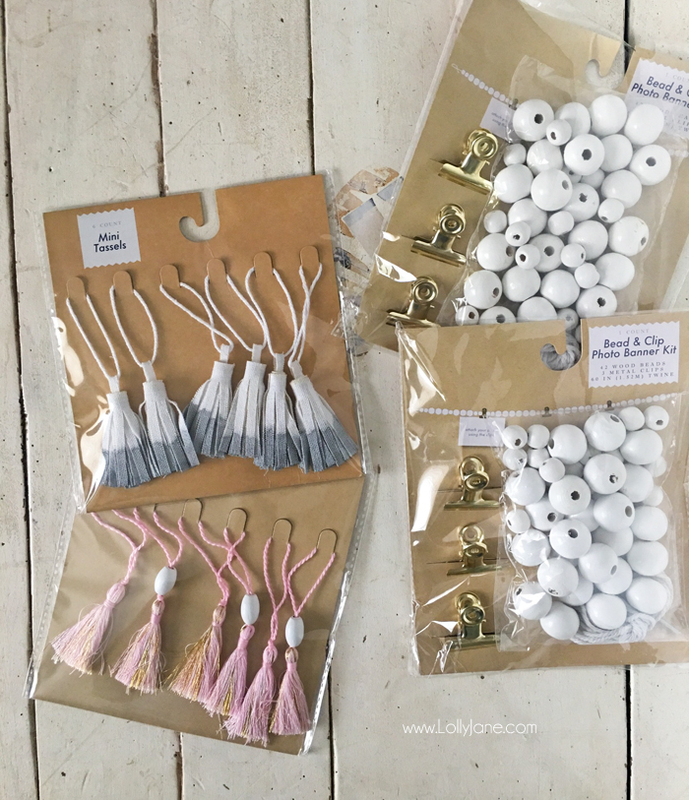 While perusing Target’s Dollar Spot, I spotted (pun intended) a photo garland kit for $3 PLUS some cute 5/$1 tassles so I grabbed 2 packs of each! 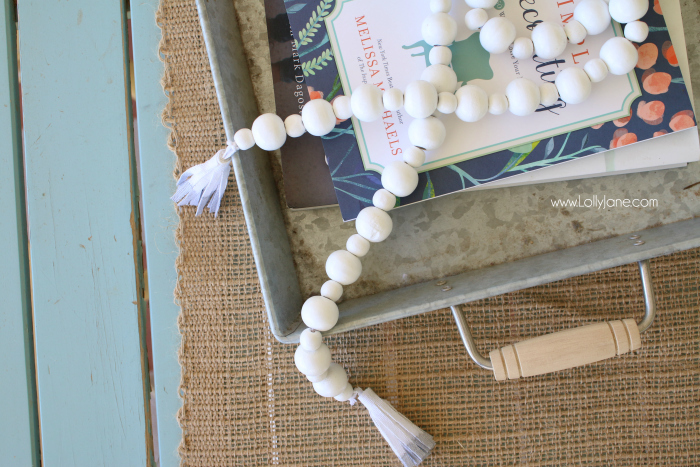 Have you seen all the wood bead garlands floating around farmhouse houses? I’m going to just throw this out there, I don’t get them. I don’t understand how or why they got popular? 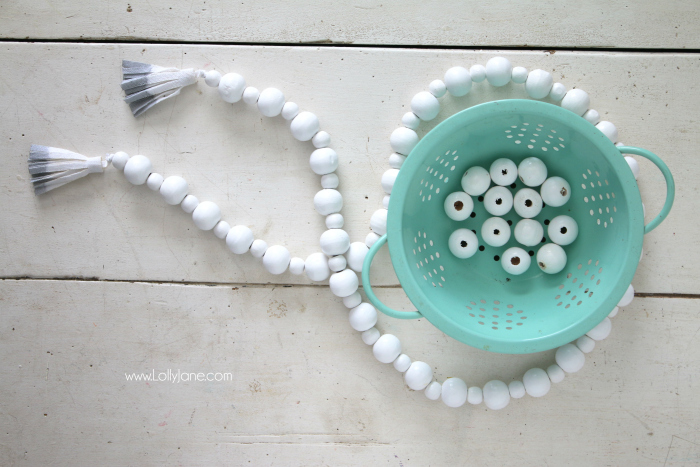 They’re a necklace for your home decor so breaking it down: they’re an accessory for your accessories? Please, fill me in on the trend. 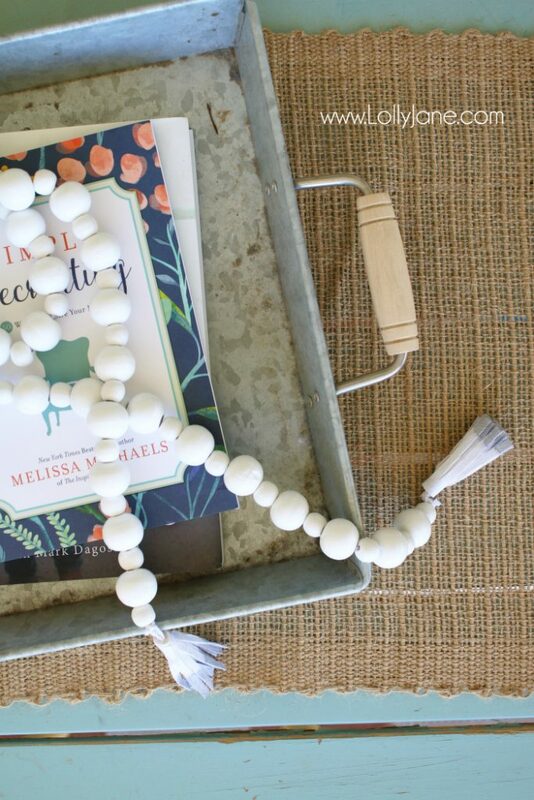 BUT, we are a home decor judgement free zone around here and we love all kinds of trends so we’re jumping in on the wood bead garland trend and showing you how to make your own for $5! 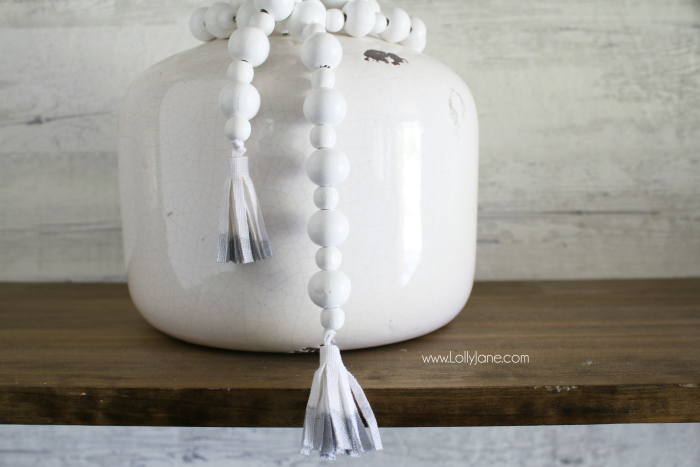 Grab 2 packs of Bead and Photo Banner kits from Target, plus your preferred mini tassels pack. 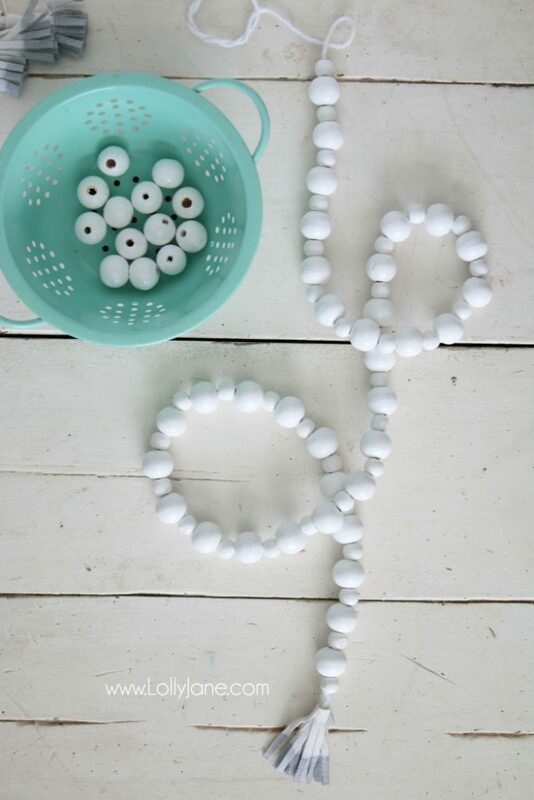 Simply thread your shoelace from the pack through the beads. Pick your pattern, we did small, big, small, big, etc. If you don’t have a Target closeby or these products are unavailable, no worries! 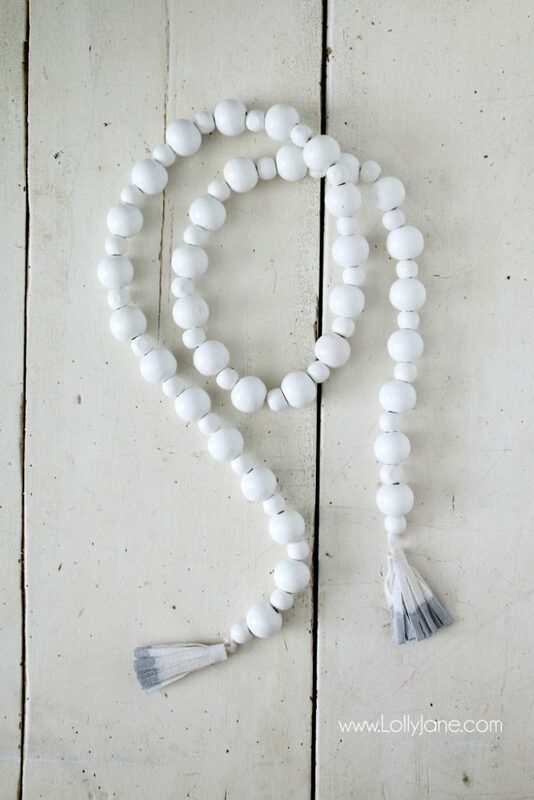 Amazon carries 10-12mm wood beads (aff link) plus cotton twine, even mini tassles to keep this project under 5 minutes! 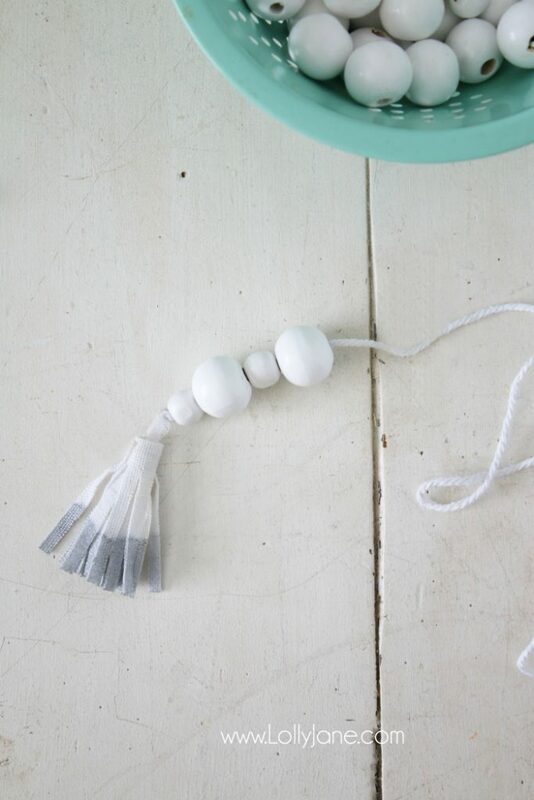 We snipped off the twine that holds the tassel then wrapped an easy knot around it instead so it hangs nice and pretty. Finish it off with a second tassel and you’re done! Fast and affordable, just the way we like it! They’re also cute laying across old books (or new! 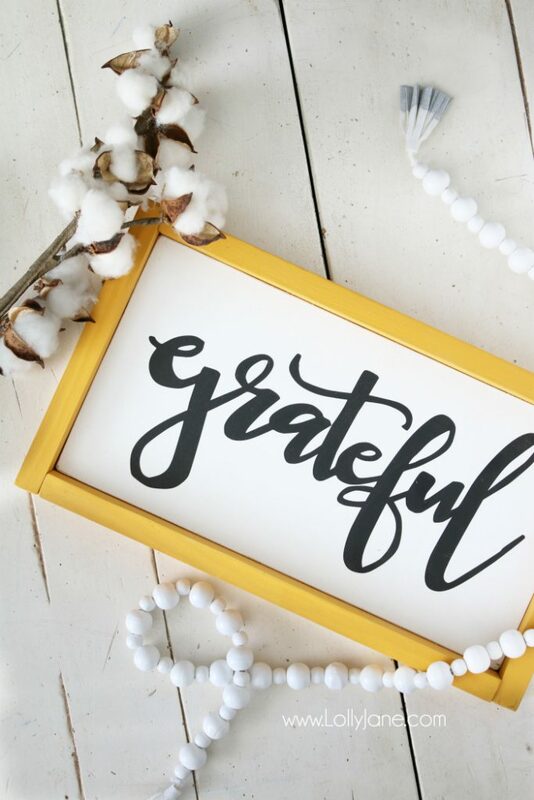 Shoutout to Melissa from The Inspired Room, love her latest book!) 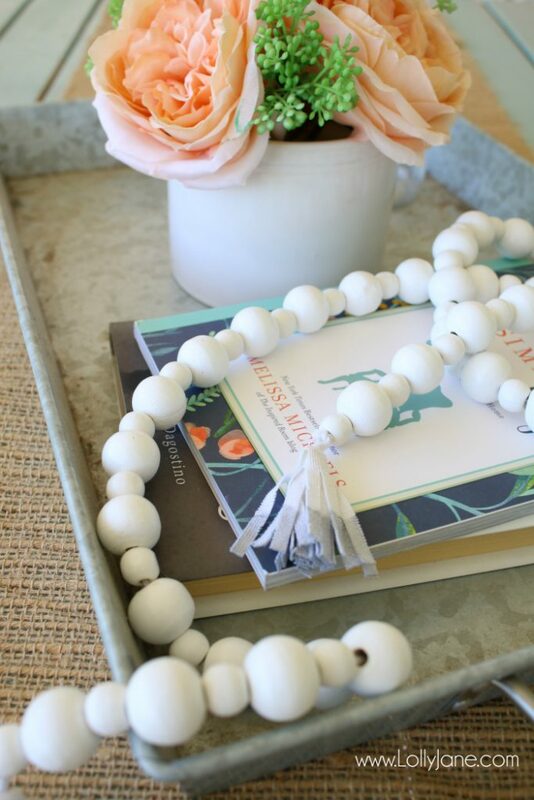 paired with florals, real or faux, laying on a galvanized tray. 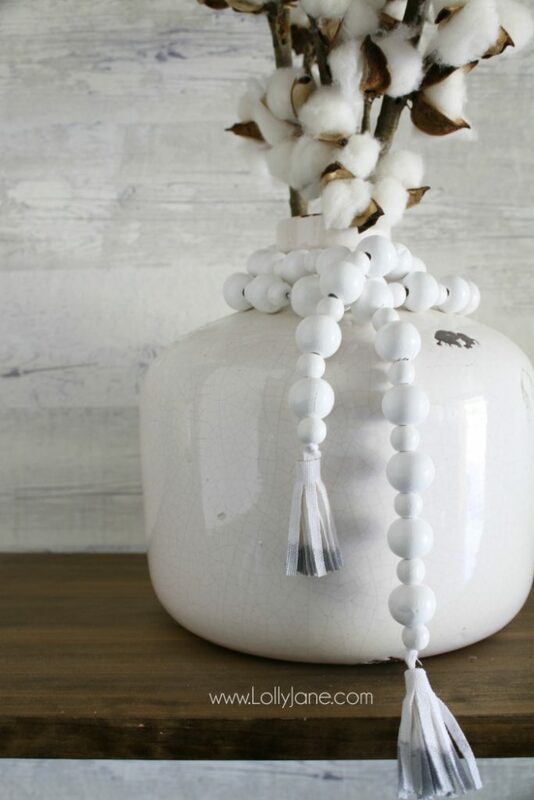 How about draped across your table centerpiece? 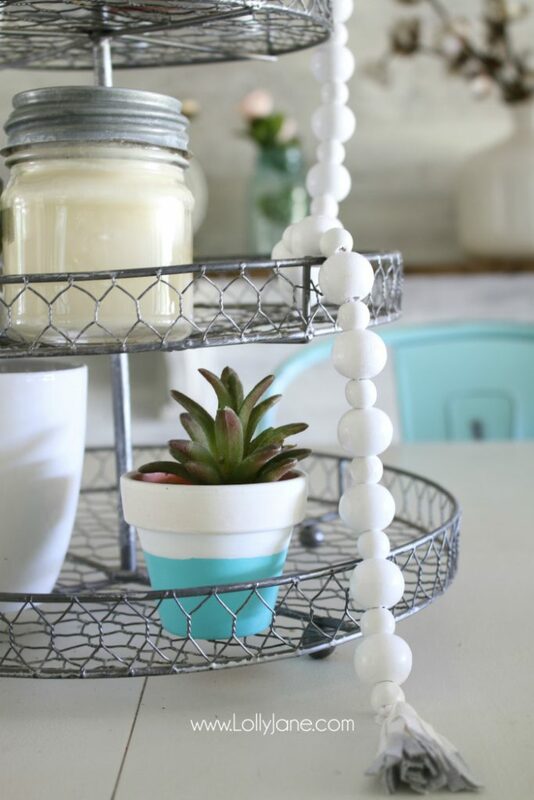 Probably the most popular display we’ve seen for wood bead garlands is hung over vases and lamps. Again, I don’t quite understand but hey, we like to layer so more power to over-accessorizing. Share your thoughts! 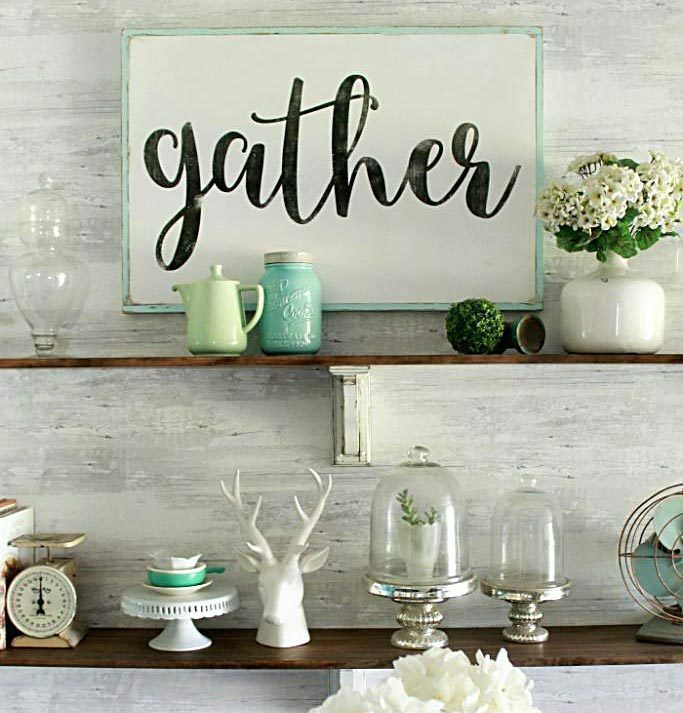 Where are you going to display your inexpensive new decor? Please pin so your pals can quickly make these too! 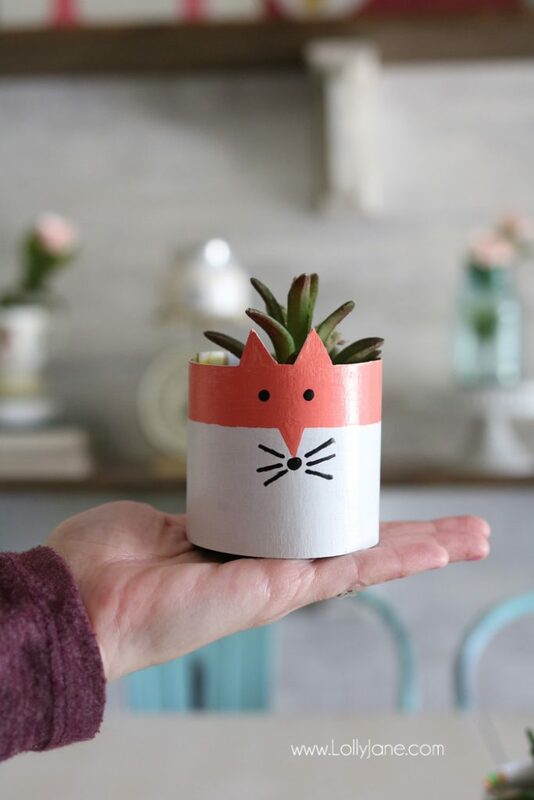 and our Toothbrush Holder turned Succulent Container. An accessory for my accessories…Lol! That is quite true. I like this set that you made since it is white, and it has a “natural” look to it. Seriously, Randi! 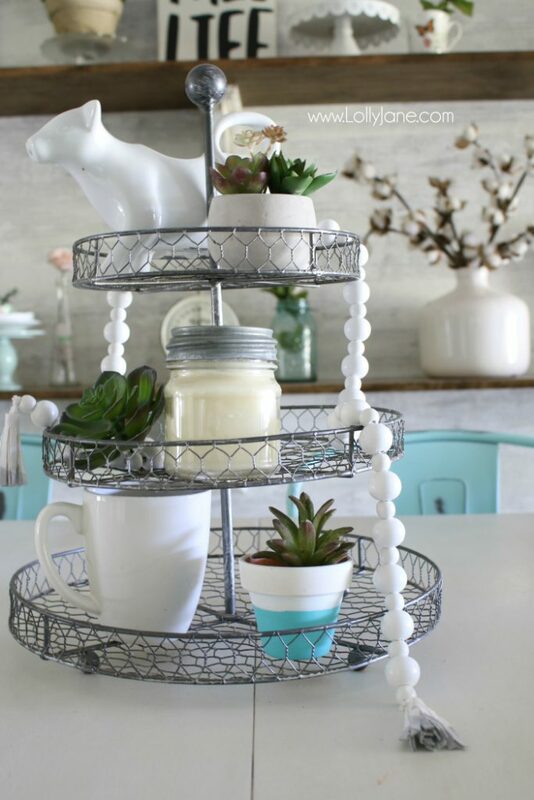 Let’s give that inexpensive aqua colander a moment of decor silence: loooooove it!! 😀 And YAY for Target’s Dollar Spot! I love this! 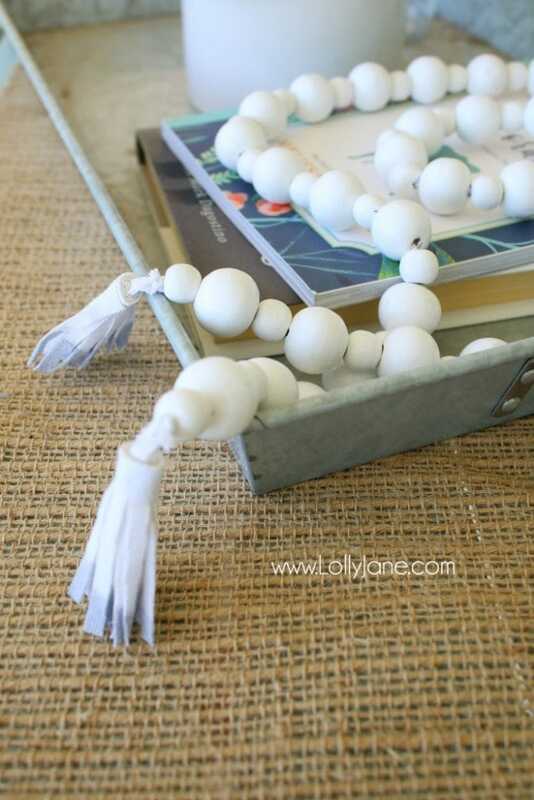 The tassels make it so cute~I hope my Target has this too! Thanks for sharing! Love yours. I actually did mine with a thrifted necklace. And so funny “accessory for your accessories ???????????????? 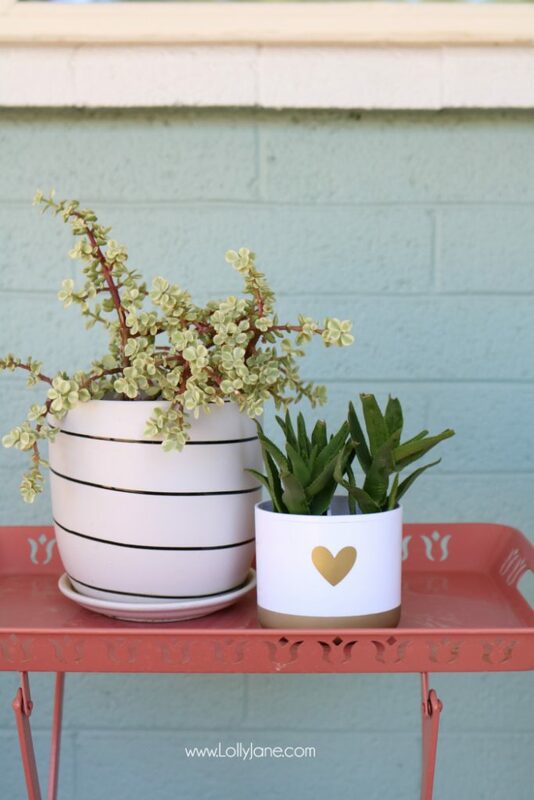 I love this and the added texture they bring to a space. I def have to agree around the vase they are beautiful! That would be lovely, Ruth! …”accessory for your accessories” never thought of it that way. 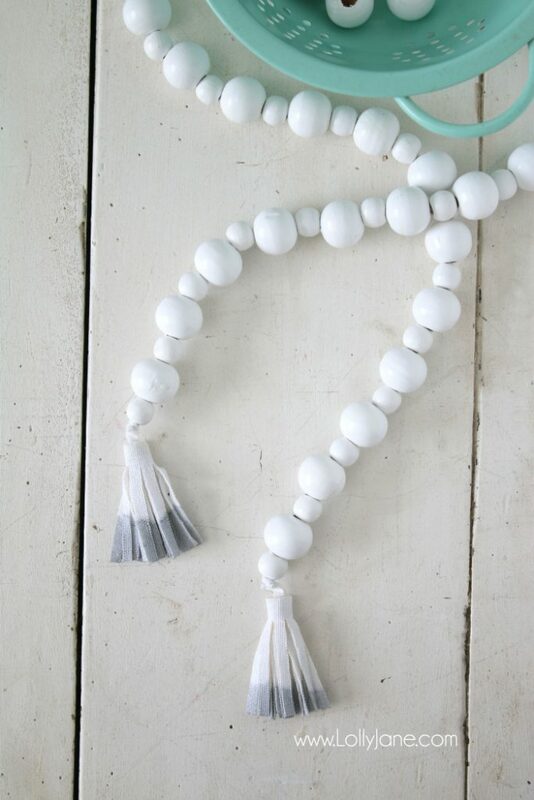 Love the bead garlands that are trending now, would love to make my own; but by time I get around to making them the trend will be gone, HA, life as a semi-procrastinator! So, I will admire yours and many others in the mean time. 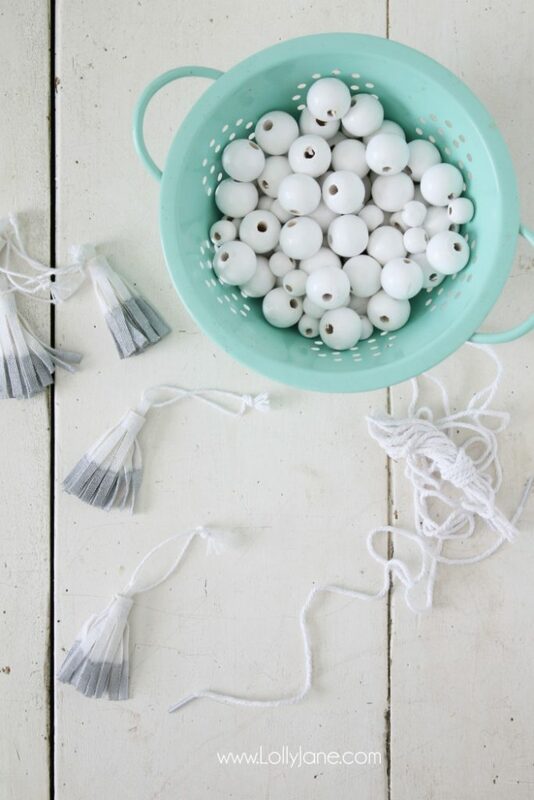 There are so many cute ways to decorate with these, thanks for the inspiration!